For almost ten years I have been researching and developing programs to improve the safety of experienced drivers. In addition, I also develop training programs focused on empowering drivers with transportation options. As a social entrepreneur, my work is to innovate and inspired by the theory of “What if” to identify powerful solutions. Freewheeling is a catalyst for changing how we think about driving. What if we change the keys conversation from independence to interdependence? What if we ask experienced drivers what they want? Those questions led to the invention of the Personalized Transportation System (PTS) and Freewheeling after Sixty. Now I am on a mission to educate 40,000 experienced drivers by 2020 on their transportation options. 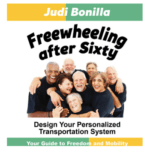 Buy the book and join a movement keeping experienced drivers Freewheeling!